Easy Out, the first spray sprinkler removal tool that requires no digging, is now available from Underhill International. Easy Out fits all major brands and simplifies head removal (2-12-inch sprays) for repairs or modifications. Easy Out can be used to replace a broken sprinkler; add a fitting to increase height; cap off unwanted heads; or convert heads to drip line. It saves time and prevents damage to turf and landscape. The Easy Out kit includes an alignment rod that prevents dirt from entering the piping system and heavy-duty removal tool with hex head at the bottom end. How it works: User removes cap and inside components, then inserts alignment rod into body. Easy Out removal tool is placed over rod and slides into sprinkler. Tool is then rotated counter-clockwise to remove body from piping system. 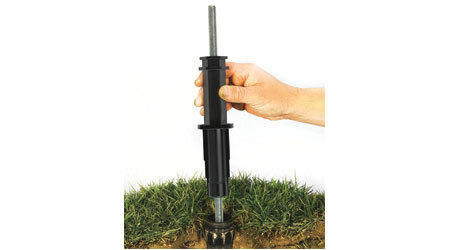 Replacement sprinkler is placed over rod and down into ground. Removal tool is rotated clockwise to connect new sprinkler to pipe. The same steps are followed to add a fitting to the bottom of the spray head, or to cap off a sprinkler, or when converting to drip by removing the sprinkler and attaching drip tubing to a barb fitting.